Been diving in Komodo? Please Vote! Komodo Island is known as one of the best dive sites in the world and it definitely deserves its reputation. The island itself is easily reached from Bali and the main island of Komodo along with a group of smaller islands which make the Komodo National Park. This park was set up primarily to conserve the famous Komodo dragon, the largest lizard in the world. As a result, the waters off the island have also been protected from fishing and shipping, so remain mostly in pristine condition. Divers will find a staggering amount of fish in these islands, and the diversity is unique, with over one thousand species of recorded fish and a coral-species count of 250. The sites themselves are equally varied and on the same dive trip, you can swim through caves, descend large walls of coral, investigate rock formations, or float over pinnacles. Explore below more details about scuba diving in Komodo. Given the variety of dive sites, the area offers opportunities for all divers and has something for all levels. The high numbers of tiny and unique species also makes the Komodo Islands a macro diver’s paradise. From liveaboards to day trips, currents for drift diving, still calm coral reefs, and with over 50 different sites for diving, the national park offers most types of diving. With such a variety of sites, it is common to come away from a visit having seen dolphins, manta rays, eagle rays, snappers, reef sharks, sea horses, tuna fish, and of course a huge diversity of coral. Whilst diving is possible throughout the year, rain mainly falls from November until March, with high season being after the rainy season. The water temperature rarely falls below 22°C and the average remains between 23°C and 28°C. The air temperature is just as pleasant ranging from 22°C to 34°C. The best visibility is between November and January where the visibility can get as high as 40 meters. It rarely falls below 20 meters with the low being around 10 meters. Fantastic diving and snorkeling. Ideal entry is approximately 100m south of the bay’s western point. Once you have rounded the point, continue diving westwards. The shallow reef at the end of the dive is an excellent coral garden. Strong currents and sometimes down-currents can be experienced on the point. Recommended time to dive is during slack-tide. A variety of small invertebrates and fish, including sharks and giant trevally, are visible while snorkeling the rocky slopes. Deeper diving to 40m reveals many coral trout, large groupers, schools of giant trevally, and massive dogtooth tuna. Entry point is at the northern tip of the headland. Swim along the reef heading into the bay with the reef to the left. Excellent hard coral garden. Frogfish can be found on sponges on the reef slope. Nudibranchs and other unusual creatures are often found in this area. This seamount was once rated amongst the best dive sites in this area. Up to 7 species of sharks could be seen during a single dive and schooling hammerhead sharks were seen in the month of September. Unfortunately, hard corals was severely damaged by dynamite fishing in 1997 and 1998 and sharks were extensively fished out by sharksfinners. Large patches of coral rubble intersperse stretches of live coral, which are evidence of what a great site this once was. Abundant fish life still exists in current-prone areas including large, missile-like Spanish mackerel. On the northwestern corner of this seamount grey reef sharks swim at 30m depth. Dogtooth tunas can sometimes be seen along the deeper slopes. This site is a pleasant, relatively current-free dive just north of the ranger station where there is a small white sandy beach and a group of low, black rocks sitting on the reef. The entry point is just off the small white beach. The dive continues towards the ranger station with the reef at left. A good variety of hard and soft corals, plenty of fish life and other marine creatures can be found at this site. This site is one of the better small island dives in western Komodo. On the eastern side of Tukohserikaya there is a rocky reef that break the surface. Although this site is very exposed to the current, it is still possible to dive on the lee side of the reef even when the current is otherwise quite strong. The best time to dive this area, however, is during slack-tide. The corals are in very good condition and fish life is also very good. Lots of a whitetip reef sharks patrol the area, which is surrounded in clouds of anthias. There is good diving on the northern and southern points of the island. The diving environment is very similar to Tukohserikaya. On the southern side of the island there are some big boulders that form an interesting terrain. Coral growth on the northern side is also very good but stunted due the force of the current that sweeps the island. This site has good coral coverage and plenty of small fish and sharks. The top of the reef is shaped like a banana and runs north to south in about 2m of the water. The western side of the reef drops down to boulders in approximately 30 m of water where the bigger fish live. On the eastern side of the reef, boulders start in approximately 10 meters of water and slope down. At the southern end of the reef is a pinnacle detached from the main reef. A variety of sweetlips species live on this site and sometimes school together. Groupers, sharks and pelagic fishes can also be found. There is a lot of activity amongst the smaller reef fish around the top of the reef. Thousands of anthias and wrasses can often be seen spawning. This site is part of a cluster of uncharted rocky islets and reefs off the point of Tanjung Saloka. The western-most islet is an excellent dive site although it is very prone to currents and swell. There is also a rocky reef just below the surface, fifty meters south of this island. Best time to dive is during slack water when the rock can be circumnavigated. The terrain is very dramatic and the fish life is prolific. Napoleon wrasse, big groupers, schooling snappers, turtles, big sharks, and giant trevallies are examples of the fish life that can be encountered here. Nisaleme is a very exposed, small, rocky island that can be difficult to dive. The entry point is usually at the northern or the southern tip of the island depending on current direction. The rock itself plummets very steeply into deep water. Caution should be taken when attempting this dive as there can be strong down-currents during rapid tidal flow. An excellent site for pelagic fish such as rainbow runners, giant trevally, dogtooth tuna, and sharks. The best time to dive this site is during rising tide when a counter-current flows southwards. The entry point is on the northeastern side the point. The dive drifts counter-clockwise along the boulders to the western most tip of the point. The water here is usually clear but can be quite cool. Also the site maybe effected by a strong surge when there are large swells. There is a nice wall as you approach a point with plenty of sharks and big fish including giant trevally and schools of snappers. There is also an excellent variety of coral reef fishes. The coral-encrusted growths are very similar to those found on southern Komodo reefs. This reef extends south from Tanjung Letuhoh and consists of big boulders and pinnacles that offer some of the best big-fish diving in Komodo. The optimal time to dive is during falling tide when a counter-current flows northwards. Recommended dive entry is on the southern-most rock that breaks the surface. Hang out on the reef face and watch the show, which is particularly good at around 30 m depth. Swim clockwise around the rock where you will encounter some big pinnacles encrusted with corals This site is affected by surge and can look quite frightening from the surface especially when there is a big swell running; however conditions are less terrifying underwater. giant trevally and snapper frequent this reef. There are also large coral-encrusted pinnacles. This submerged pinnacle dive is located southeast of Langkoi Island. The site is very exposed to current and sometimes to big surge. Usually a swell banks up against the pinnacle but on a calm day the site can be difficult to find. A GPS position is recommended as the pinnacle is not marked on most charts of the area. The rock rapidly plummets into very deep water. Best diving entry is to jump in upcurrent from the pinnacle, dive straight down, hang on the wall and watch the show of fishes. This dive should not be attempted by inexperienced divers. This excellent dive site is often on Komodo liveaboard itineraries. This site can be a real adrenalin rush at the right time. Many sharks such as Grey reefs, Whitetip reef sharks, hammerheads and bronze whalers aggregate around this site from July to September. Also a potentially good place to see pelagic fish as well as resident potato cods at the southern point in 30 meters of water. The tiny rocky islands in this southern Komodo bay are great for snorkeling and diving, with even if there are no mantas. Only little damage has been done to the corals in this area and the damaged corals seem to be recovering rapidly. The best diving entry point is on the northeastern side of a rock located near a coral mound that is submerged 3-5m below the surface The temperature of the water can drop to the low 20°C range and this site tends to be current-prone. This area is marked with very large giant trevally, sharks, beautiful coral and a high diversity of other invertebrate life in relatively shallow water between 5-20m depth. Sometimes lots of manta rays may be seen feeding between September and January each year. Cooler water from the upwellings off the south coast provide a nutrient-rich environment in this area. There is usually current at this site and a drift dive is usually the best way to go . From September to January high densities of plankton attract many large manta rays that can normally be seen swimming on the surface along the shores and rocks along southern Komodo Island. The nearshore water is quite shallow (5 – 20m deep) and is composed of large rocks and boulders that shelter huge malabar grouper, potato cod, napoleon wrasse, schools of surgeon fishes and red snappers. The southern point of Tala island is characterized by steep rocky walls and occasional strong surge. Abundant small fish life at shallower depths, interesting invertebrate life on the walls and lots of larger fish somewhat deeper. Enormous schools of surgeon fish sometimes obscure views. Schools of large red snappers, whitetip reef shark and huge groupers further down amongst the boulders frequent the reef. Superb diving all along the southern point of Loh Sera, or off the point towards underwater pinnacles. Due to potentially strong currents only experienced divers should attempt to swim to the pinnacles. Beginner divers should stay along the wall. Great snorkeling along the northern shore of this cape. Large pelagic fish like dogtooth tuna can be seen circling off the point and around the pinnacles. Turtles and large fish such as monster- sized giant trevallies, potato cod, malabar grouper, schools of bumphead parrotfish, napoleon wrasse, manta rays and much more can be seen along the wall. On the south west coast of Rinca you will find a point marked Toro Sie. Adjacent to the point is a rock awash. This rock has a ridge that extends to the west that is covered in crynoids and softcorals. On the seabed around the rock lots of interesting critters can be found. If you swim out over the sand southwest of the rock there is a patch reef that usually has excellent fishlife on it and quite often a few big grouper. This dive is usually has better vis during the NW monsoon along with most of the parks other southern sites. Yellow Wall is an excellent day or night dive spot just inside the southeastern corner of Loh Dasami Bay. It is also one of the best areas in Loh Dasami for snorkeling. The current usually flows south to north so the best entry point is just around the western-most tip of the headland; the dive should then continue into the bay along with the current. A very good place to see invertebrate diversity, especially during a night dive. Walls are packed with a mind-boggling array of marine life and colors including colorful sea urchins, bright red sea apples, beautiful soft corals, Spanish dancer nudibranchs and a great variety of tunicates. Crevices in the wall reveal sleeping fishes, spiny and slipper lobsters, cleaner shrimps, and decorator crabs. Nighttime fish life include sleeping coral trout, cat sharks, all kinds of cardinal fishes and parrot fishes in their mucus cocoons, as well as sleeping turtles. Cannibal Rock is a small seamount in wellprotected Loh Dasami Bay, between Rinca and Nusa Kode, which allows for easy diving with little current. Night dives are excellent, especially on the sandy slope of the northern side of the island starting at about 25 m depth. This site is famous for its varied and colorful invertebrate life. Rich soft corals abound as well as sea apples and other sea cucumber species. Amongst many surprises are flamboyantly colored nudibranchs, and fire urchins with Coleman shrimp. The fish life can also be quite good at times with an array of scorpion fishes, schools of red snappers and surgeon fishes. Unusual fishes such as pygmy seahorses and frogfishes may also be seen. This site is located in a small cove just outside the southern entrance of Loh Dasami on the island of Nusa Kode, almost directly opposite Yellow Wall. The diving entry point is just south of the cove then continues along the wall in a counter-clockwise direction. Best to start the dive at 25 m depth and then continue swimming back and forth up along the wall to the surface. This is a easy dive location with no current and is good in the early morning as it catches the morning sun. Many kinds of small invertebrate life can be found here on very colorful walls carpeted in featherstars. This site is located on Nusa Kode where the bay widens just northwest of Crinoid Canyon. Directly below this point there are several big boulders laying on the bottom. The shallowest boulder is in about 8 meters of water and the deepest one is in about 30 m of water. A torch is useful on this dive. The best point of entry is 100 meters south of the point where the reef slopes down to soft coral forests on a dark sandy bottom in 30 to 35 m of water. Continue the dive to the boulders by ascending to 20m with the reef to the left. This is also a good night dive location. The dive begins with forests of soft coral at 30-35m depth. Along the way to the boulders is the best place in Loh Dasami to find fire urchins with Coleman shrimp. The boulders themselves have good coral, invertebrate and fish life. Quite often manta rays can be seen in this area as well. Located north of Cannibal Rock, critters can be found on a patchy rocky reef at a depth of 15m. A great low environmental-impact dive for photographers as most of the rocky habitats are surrounded by sand. An excellent place to find unusual critters such as torpedo rays, Bobbit worms, flying gurnards, frogfish, and ghost pipefish. Diving entry is west of a small island at this site. Swim down to a depth of about 10 m and follow the ridge, which juts out in a southerly direction. Swim along the crest of the ridge and down to a max of 50 m depth. The south western tip of Kode island is characterized by large, coral-encrusted boulders and huge groupers. Amongst the boulders are some of the largest reef fishes residing in the Park such as gigantic potato cod and malabar grouper. Schools of large red snapper are normally prevalent. The southern and western sides of Payung island offer the most interesting reef scapes. A rock in the shape of a cannon lies at 5 m depth on the southern tip of the island. As with most dive sites in the southern section of the Park, visibility is relatively low (5-10 m) and the water is cooler (low to mid 20°C range). This site should be dived at slack-tide, preferably during slack of low tide. Two dives are possible: The first dive descends at the northwest tip of the island (near the rocks that nearly break the surface) and continues south (with the slope on your left) at 15-30 meters depth, then turns at the southern-most end of the island and ascends to 10 m depth. The second dive starts at the southeastern side of the island and proceeds around the southern tip of the island at 20-35 m depth, then ascends to 5-15 m depth. Very interesting underwater landscape with huge rocks that give the illusion of a wreck dive. There are many canyons and crevices to explore. Fish and invertebrate life is diverse and abundant. There are big schools of surgeons and smaller yellow snappers (Lutjanus kasmira and L. quinquelineatus). Rocky reefs are covered with soft coral, gorgonians and feather stars. Located north of Pillaarsteen, there are three very large submerged rocks about 10m apart and within easy swimming distance of each other. The rocks run in a line about 100 meters east of a small reef that juts out on the eastern side of the island. The rocks sit on a sandy bottom in about 20-25 m of water and rise to 3-5m from the surface of the water. The site can be hard to find as its not marked on any charts and the rocks lay just below the surface. This site is current-prone but can be dived almost any time if you are willing to swim. For the adventurous there is actually a fourth sister located further to the west that starts in about 20m of water and then drops down to 40m with some impressive seafans and good marine life around it. A pristine reef with excellent coral coverage and rich fish life. Pillaarsteen is a rock pinnacle located on the shore of a small island east of Padar Besar. Best diving entry is just off the point below the rock where there is a nice wall. Continue swimming to the west towards interesting caves and swim-throughs at different depths. Diving is particularly good at around 30-40m depth. This site is a good choice when other sites have too much current. This area may be effected by surge when there are swells from the southwest. Very interesting reefscape. Large schools of fusiliers can be found here along the reef slope, which is covered in an interesting variety of soft corals. Sharks and the odd turtle are often encountered. This small island with steeply dropping walls is close to Loh Liang and an ideal location for divers starting from Komodo Island. This dive has to be planned around slack tide to avoid excessive currents. The best time to dive here is at the end of falling tide when the current has slowed down and allows an easy north to south drift dive along the eastern wall. Many big fish and good coral diversity can be seen when drift-diving along the steep walls. Top attractions include potato cod, large Napoleon wrasse and schools of giant trevallies and snappers. Dive around the point of Loh Namu peninsula from south to north at a depth of about 28 m, and always just before high tide. An excellent site for groupers and Napoleon wrasse. Most of the fish on this reef are found near the southern corner where some large boulders spread out over the drop-off. A few caves also offer hiding places for interesting marine life. Some of the largest coral trout schools seen in the Park are here along with malabar groupers and huge Napoleon wrasse, which may aggregate here to spawn. You may also find a giant T. gigas clam at 8 meters depth. This is the most frequently visited site in the Park for snorkeling and diving. Snorkeling is excellent from the beach and there is a very good dive around a small area of reef around a steep rocky wall which is visible from the surface of the water at low tide. This site is also a very good night dive and offers excellent macro-photography opportunities. Several mooring buoys are stationed at this site. There as a great variety of fishes here and also a good selection of critters such as leaf scorpionfish, blue ribbon eels, crocodile fish, nudibranchs, and more. Visibility varies but is best during falling tide. Batu Tiga is without a doubt one of the most current-effected sites in Komodo and is tricky to dive. A rocky reef is situated southeast of Tanjung Kuning in Linta Strait and extends below the surface up towards Komodo Island. The best diving entry is at the northeastern side of the three rocks. Swim counter-clockwise until reaching some big boulders at 33 m depth. After exploring the area around these boulders turn around and swim back, keeping the reef to your right. An excellent “big fish” dive. Large boulders in deeper water to the west offer excellent habitat for grouper and other creatures. Mantas, giant trevally and other pelagic fishes are frequently seen here. Most of the coral growth is stunted as a result of the strong prevailing currents. This site is for snorkelling only, please don’t dive here as it will disturb the manta rays. The reef does not have much in the way of coral or fish life however this location is manta ray aggregation site. The best way to find the mantas is to cruise along the eastern face of the reef until you see them on the surface. The best time is during rising tide. Sometimes there can be between 40 to 50 mantas. Batu Bolong is a tiny rocky outcropping in the strait between Tatawa Kecil and Komodo Island. The reef is undamaged due to strong currents and steep dropoffs, which are difficult conditions for local fishermen to use dynamite or cyanide fishing techniques. This site is one of the top diving locations in the Park but it can only be dived around slack tide when the current is not too strong. The top of the reef is covered in colorful corals, invertebrate life and thousands of brilliant reef fish. Along the steep walls in deeper water many large fishes including sharks, napoleon wrasse, giant trevally, dogtooth tuna, and large schools of rainbow runners can be observed on almost every occasion. This small rocky islet southwest of Tatawa Besar Island is an egret nesting site and a fantastic snorkel and dive site when the current is not too fast. Large or inexperienced groups should only attempt this site around slack tide. 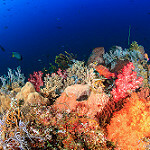 This highly recommended dive site is often on Indonesia liveaboard itineraries. Rocks, caves and beautiful coral gardens grace the reef on the western side of the islet. Many coral reef fishes including large groupers, snappers, sweetlips, trevally and sharks can be seen. Amazing numbers of anthias swim amongst colorful fields of branching corals. Dugongs have been spotted here and manta rays are often seen on the southern side of the island. A good drift dive starts at the northwest tip of the island and runs along the western side in about 15- 20 m of water. A similar drift dive is also possible along the north coast of the Tatawa Besar from the same entry point. This site is a good dive option if the current is too strong at Tatawa Kecil or Batu Bolong. Good reef fish life and an endless field of orange soft corals. Mantas are often seen in this area. This is another good site within easy reach of Labuanbajo. On the west side of the island there is a small white sandy beach. At the northern most point of the beach where the sand meets the rocks is the best point to enter. The reef slopes down to sand and there is a patch reef isolated from the islands fringing reef . The Water clarity is usually good and so is the dive. Once you have seen the patch reef you can return to the fringing reef slope to finish your dive. This dive is an excellent refresher/check-out dive or just a nice easy dive with good visibility, calm conditions and no current. The diving entry point is marked by a long, low, rocky point east of the beach, which is at the center of the island’s northern coast. Enter just on the eastern side of the point and swim counter-clockwise around the point at 20-25 m depth . Once around the point the reef slope will turn into a wall that drops to about 35 m depth. The wall continues to a sandy slope in front of the beach, which marks the end of the dive. A second dive can begin at the sandy slope and continue counter-clockwise across the front face of the beach to where the reef turns north and juts out to another point. The whole north face of this island is good diving. There are garden eels on the sandy slopes, and shrimp gobies and sweetlips are common. Occasionally, mandarin fish have been spotted in shallow water. 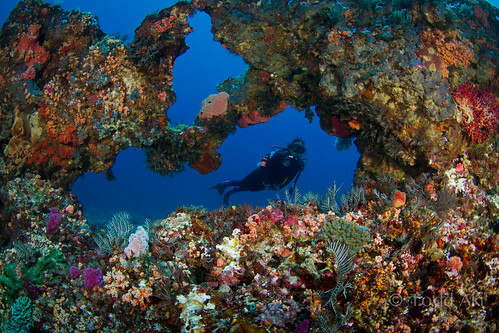 This site also features beautiful coral gardens with a high abundance of both hard and soft corals. The northwestern corner of Sebayor Kecil is one of the better dive sites near Labuanbajo. A small reef extends northwest from the island where it drops off to greater depths along the northern coast of the island. A few hundred meters from the shore there are some large boulders with notable fish life. Currents can be quite strong at this site. Large boulders shelter groups of giant trevally, whitetip reef sharks, coral trout, snappers and emperors. The site is located on the northeastern tip of Gililawa Laut. The best time to dive this site is when there is a slight current just before or after slack-tide. 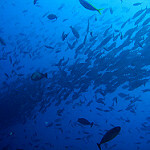 Always a great dive site to see fish but does not have much to show in terms of hard corals. Behind a very large rock on the corner of the reef is a drop-off covered in boulders and many holes in between with hidden animals. Excellent grouper sightings, especially in October and November during spawning aggregations. There are usually many golden trevallies, snappers and sometimes huge napoleon wrasses. This site usually has excellent visibility but is prone to strong currents. The current usually flows eastwards and is much stronger at the surface than in the deeper water. However, the top of the rock, which is approximately 3 to 4m deep, also offers shelter from the current; hence the name “Castle Rock”. Recommended dive entry point is in blue water approximately 50m up-current from the shallowest point of the reef. Curious batfish as well as schooling barracuda, trevally and mackerels swim at 30- 40m depth. At approximately 20m depth there is excellent soft coral growth and numerous seafans that host pygmy seahorses. The top of the rock is a good, calm place to explore during safety stops. An excellent Komodo dive usually worth doing twice (best done from an Komodo islands liveaboard). This name of this site is from the very clear water surrounding it. The top of the site is exposed at low tide. This site is prone to currents, which usually flow eastwards. Best time to dive is during slacktide. A very colorful dive with excellent soft coral coverage. Clouds of anthias and schools of yellow-ribbon sweetlips are always encountered while frogfish, moray eels and scorpionfish are commonly seen. There is a small mound northwest of the rock where different species of fish school seasonally, including tuna and mackerel. An excellent drift dive and good snorkelling can be found on the northern side of the channel between Gililawa Darat and Komodo Island. The dive can be done from east to west or vise-versa depending on the current. The visibility is usually better if diving from west to east. Best to dive just before or after slack tide when the current is not too strong. The best diving entry point is on the reef slope on the west side of Gililawa Darat Island, about 100 meters north of the channel. Swim towards the south-western corner of the island. The current is usually very gentle in this area. The sandy bottom starts at 15 m depth then drops away to about 35 m before rounding the southern corner of the island and into the channel. Get ready to drift as the channel becomes shallower and the current increases. Recommend to stay shallow and on the northern side of the channel as the deeper section of the channel has rubble, boat traffic and a downcurrent at the end of it. You will gradually get closer to the island towards the end of the dive. The current eventually decreases near the end of the dive. The reef slope is very rich in marine life and the sandy bottom at 15m depth is covered in garden eels. On the approach to the channel, turtles may be seen as well as a school of giant sweetlips that live in a grotto near the surface of the water. Around the southwest corner of the island, the shallow reefs are extremely rich and full of fish life. Bumphead parrotfish are commonly seen and aggregate here to spawn annually around the month of April. Sharks and schools of batfish also reside in the passage. A large coral head about two thirds of the way through the dive teems with life and activity. Good snorkelling here although a lot of damage has been done by fish bombing and reef gleaning (meting).The entry point for this dive site is inside the bay along the eastern shore of the peninsula with the reef to the left side of the diver. The best time to dive is when the current is running from east to west through the narrow passage between Gililawa Darat and Komodo Island. The dive ends when the current brings you around the point. The best place to see many fish while snorkeling is at the tip of the point.Gililawa Bay is a good anchorage for boats. Turtles can be seen on this pretty coral reef. At 20-25m depth to the south of the point, many small coral trout, large schools of anchovies and small tuna and trevallies come in to feed in the bay. Deeper along the bottom of the slope fish life increases; garden eels sway and whitetip reef sharks sleep on the sandy bottom near the point. Komodo island offers liveaboard divers a wide range of choices. While there are brilliantly-coloured reefs teeming with fishes and invertebrates to entertain those who prefer shallow diving, there are equally attractive shoals of fishes deeper down to amuse deep divers. A liveaboard cruise in Komodo Island will show you an incredible array of rich marine life. Since the island is situated close to the centre of the world’s most spectacular coral reefs and other sea critters, many of these can be seen here on a liveaboard cruise. Pygmy seahorses, varieties of nudibranchs, ornate ghost pipefish, blue-ringed octopi, dolphins, manta rays, eagle rays, sunfishes, clown frogfishes, sea squirts, sponges, and tunicates are feast to the eyes here. It is a macro diver’s paradise. Komodo Island and the nearby Rinca are geographically a part of Flores, the island arc that stretches eastward from Java. They are separated from the island Sumbawa by the Sape Strait, in the middle of which the bottom has a depth of 300 metres. The shallow waters between Komodo Island and Flores undergo swift tidal changes when the tidal waters of the Pacific Ocean flow into the Indian Ocean and thereby generate swift currents. The waters are kept rich in nutrients by the deep surrounding water, thus making it an ideal place for scuba diving. Find more info about all the Komodo Liveaboards below. Feeling inspired and raring to go? Check out our Komodo travel guide and start planning your next diving trip! My name is Pablo, SSI OWI from the Canary Islands, speaking English, French and Spanish. Nice to meet you! I would imagine that you expected a contact from a possible guest inquiring about booking a dive trip, but here I am to express my desire to look for an opportunity to continue working in the Indo-Pacific by the end of this year (more specifically by mid October or November) in liveabords around the area you cover. I m fully comfortable with boats lifestyle. I crossed the Atlantic a few years ago in a fishing boat with some puppetiers (Tv Documentary called Foam Dream was made) at since then I love the idea of sailing. Do you think you could help me? In order to be subjected to any evaluation for a possible opportunity I’m attaching my resume to any email address you would provide. As you’ll note, I m currently finishing the summer season in Gili Meno, place subjected to mild to strong currents. I’m fully available to answer any questions you may want to ask regarding the information on the CV attached, besides other inquiries related to past experiences as a dive guide and instructor and working in dive shops. Thank you very much for the time reading this message, hope to hear from you somehow. Could you please tell me about liveaboard dive cruises for which you have availability in Raja Ampat starting in mid-December for two adults? We are diving agent in Bali and we have program diving in Maluku and Papua. my name is Fabrice and I used to work for liveaboards in Indonesia as cruise director in the past. I have an inquiry from a group. Shorter is fine as well. This would be mainly family cruising. They are after beach, BBQ, snorkeling, some diving, kayaking, land tours. Could you suggest what the itineraries and activities would be? What would the full charter rate be per night (published and net)? I’m Larry from Singapore, may I ask a few questions regarding to this sale, first of all is whether if the sale is still ongoing? I wasn’t able to reach you on the forum, there some issue on the message board. 1) Is it possible to share the reasons of why you intended to sell off this business away? 2) Your licenses/permits are validity till when? Are they all able to transfer/extend? 3) Is there any special requirement for foreigner ownership or what is the most appropriate procedure to take over all the licenses/permit/vessel. 4) When is the last dry docking and maintenance done for MV Felicia? 5) In future are we allowed to bring in another vessel from overseas under these licenses/permits to expand the fleet? Im Philipp from Switzerland 32 years old. Im highly intressted in takeover your Phinishi Schooner for my future. My plan is to open the first Sportfishing-liveaboard in southern Indonesia. I have much from the indonesian culture inside me. As 3 year old boy i lifed with my parents in Bandung, where my father was a teacher for severals years in PMS-Bandung. Im working as Engineer for one companie as a freelancer. Next to that i have build up my own fishing-tackle brand. More and more i want to move to indonesia and build up my dream-business. Hello and good morning Sir/Ma’am!My name is Nasrudin and i’m hereby like to kindly find out if there is any crew position available for me to apply to.I have experiences working in the field of service and hospitality for many years such as in the hotel,restaurants,and the cruise ships also.To know more about me i would be glad to send my resume for you to review when it’s needed.I couldn’t thank you enough for your time and consideration,i wish you a pleasant day and hope to hear from you soon. I am looking to buy a liveaboard boat (with resort).